Holy christ what is this, I updated a whole day early??? This page was sort of easy drawing-wise, that’s why :B Haha. I’m excited about pg 22! Today’s pimp goes to the excellently rendered comic Strays! I generally do not read comics about animal people (with the exception of the ones that I need to keep up on in order to snark), but I can’t help liking this one. Nice characters too, including one who doesn’t talk (which is sort of rare for a webcomic). Check it out! As for me, I have some more comics to ink. And wow, so much emotion. ;_; Oh, I love Phe’s words, and lovely layouting to go with them. All in all: a Very powerful page! I’ve really got to applaud you on this page! The writing here is very potent. I love the lines around Luca’s cheekbones too. There’s something about Phe’s lips and fingernails that makes her seem so real. Great page! The lighting on this page is amazing. As is the writing and lineart and THIS ENTIRE PAGE IS AMAZING. Wow…the writing here is great, the emotions of both characters are palpable. Wow. Very powerful D: Knowing sort-of how it turns out makes it even more so. Oh man oh man choose her choose her! … but of course he won’t. No plot otherwise, right? I dunnoooo I guess you’ll have to wait to find out! Favorite page so far, hands down. And there aren’t even that many panels! Oh, goodness gracious, these pages really just wrench at my heart. :( We all know what’s going to happen, and it hurts. …Of course, then I noticed the little line underneath Phe’s earring in the third panel–is that a cut? I can’t tell. Man, I knew from the voting previews this page was going to be heavy. You render emotions so well, it’s heart-breaking! So I’ve never really commented before because I think everyone else manages to convey that each page is absolutely amazing. Your ability to portray emotion through the various perspectives and colors and words is astounding! I don't think I have ever actually teared up while reading a comic before. I can't wait for the next page, as always. You have me on the edge of my seat. Phe is gorgeous. This strip made my eyes tear. I don’t want a bad outcome but it’s really emotionally pulling. Great page, very emotional and beautiful art. I was going to comment on how much I loved the last two panels, but I checked again and decided I loved all of them. I small crit however, the action dialog by Phe in the is a little bit confusing. It looks like the action bubble is coming from Luca through the door. Combined with all the shouting he was doing earlier and it caused me to do a quick double take to clear it up. This is a good chance for me to comment XD I’ve really enjoyed the last few pages. The emotion is very intense and, despite getting angry with how Luca was treating Phe before, my heart broke at his terrified expression when she said she was leaving. I’m eager to see what happens next. Thanks so much for the pimpage <3 And keep going, this comic is great! No prob! It was just a matter of time till I got around to pimping you guys :) Keep up the good work! I could hear the choked back sobs in Phe’s voice as clear as day when I read this. And like many have said before me, her lips and her nails made her seem so real that I literally cannot describe any better than that. Wow. You are amazing, and I you don’t continue doing what you’re doing, I may have to ask for some serious cosmic intervention. I hope she doesn’t leave him. I really do. Gah, I just love the emotion in this page! Luca, do something darn it!! I’ve known about Strays for a while, just didn’t get around to pimping them ’till now. I love how they color their pages, and the consistency of the quality of the art is such a breath of fresh air. Also, I just checked out Strays….excellent choice for a webcomic pimp! I’m almost finished with the archive and I love it love it love it. :D Thanks! Very great page. The emotion is presented so well in this page! I like this. I’m looking forward to some good character development in Luca’s future. Oh wow. I want so badly for Luca to choose Phe, but…I’ll be surprised if he does. I can say from unfortunate experience that deeply-held racism, when present, tends to win over loved ones in terms of a person’s priorities. Plus, that would be a very boring happy ending. Unless he intends to pretend he’s made a choice and keep her out of political matters from here on….he doesn’t seem like the subtle type, but I could see it. I also think that Phe would see through it, though. Overall, this page is amazing. The panel format is simple, but art and lighting and the dialogue–you can really feel that Phe is at the end of her rope. Luca’s expression, though clearly surprised, is just blank enough in its shock to make one unsure just -how- he’s going to react on the next page. It’s like that deafening beat of silence that hangs in the room right after something absolutely incendiary has just been said. Lovely. 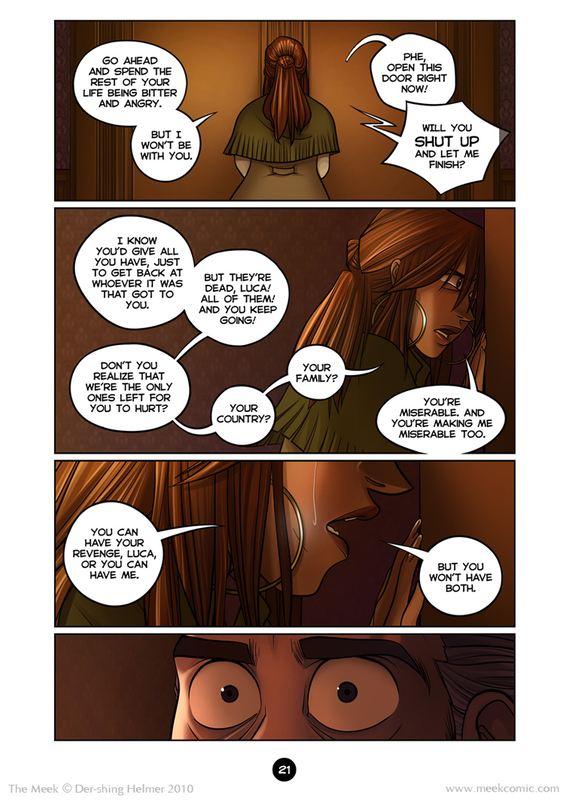 I really love the emotion in this page; very powerful. Phe’s profile in panel 3 is gorgeous. Wow… just… wow. As others have said, the art is extremely realistic while still letting your own style shine through. Phe’s dialogue is amazing, revealing so much so eloquently. It dovetails with what’s been revealed about Luca and the war before this: horrendous things were done, in mass and personally. Luca and his people paid a horrible price for what little they have, so of course he wants revenge, restitution, closure, etc. But no matter what he got, I suspect it would never be enough. How could any amount of reparations make up for his torture, his trauma and the knowledge that it was done deliberately on a huge scale? Phe realizes this, but Luca doesn’t, or is not ready to admit it. Where things will go from here, I have no idea. I’m looking forward to finding out. The dialogue here is fantastic. Fantastic. I’m speechless. OMG. I love this page! Phe in the second to last panel = :love: <3!! Can't wait to see what happens! Really powerful page…I love everything about this one. You know I originally found this webcomic through Strays. Great art as always, and also great writing. Anyone who doesn’t know about the Meek’s world gets a good understanding of what’s at stake in this one page. Phe really is a gorgeous woman. Lucaaaaa!!! Don’t be like those stupid people in the movies! Make a choice that surprises us! Break down! Don’t be a man! You need her! You can’t even dress yourself without her! Hear what she says, and don’t forget it! … increadible, a trully awe inspireing page. Be strong Phe. Luca, make the right choice. This page is beautiful, and the dialogue is amazing, but you’ve already heard this a thousand times. I love Phe’s figure. She actually looks like she’s had a couple of kids… A lot of artists, particularly in comics, tend to forget how a woman’s body changes after giving birth. I doubt it’s really going in one ear and out the other. On the contrary, I think this will just be one more thing he blames on Caris and her people. I don’t know, I don’t think it’s an ultimatum. Sounds like she’s just seriously had enough. Maybe she’s tried for years to get him to be a better person, and now she’s just fed up. I’d stay it started being “bad love” when Luca started resorting to violence against his loved ones when they get in the way of his revenge. This may not be the best way of making someone into a “better person” as you put it, but Phe is also concerned for her own safety (and that of her children) here. Implying that Phe isn’t being properly considerate of Luca’s personal development here is kind of ignoring the larger picture, no? So, what should she do? Let him continue to abuse everyone around until he magically “gets it?” It’s called tough love and sometimes you have to do it. It’s not Phe’s responsibility to make Luca a better person. Only he can do that. She can help and support him, but if he’s not willing to do it himself, there’s nothing she can do for him. He loves her and their children, but as long as his hatred keeps overruling his love, it’s only a matter of time until things go completely pear-shaped (things are clearly on their way there already). Besides, they’ve been together long enough to have three children, I’m sure she’s been trying to help him for a long time. He has reasons for acting the way he does, but if he can’t control himself, Phe is not obligated to follow him on his path to self-destruction. Heh. Everyone is all rooting for good things to happen. Personally, I hope this all goes very tragically wrong. No, Luca, back away from the light! It’s more fun here in the darkness, c’mon! It sounds more like a last chance than an ultimatum. (there is a difference) She doesn’t want to do it. She wants him to be like he used to be, but she can’t keep pretending. This is a very hard thing for her to do. It’s probably a little strange to be bringing it up now, but… gosh, Phe is beautiful. I wasn’t really seeing it in the earlier pages, with the way she was so calm/stern, but it’s definitely showing now that she’s not bottling everything in. And yeah, this definitely won’t end well… which makes me that much more excited to see what happens next! Popcorn, anyone? I am on the tip of my seat, figuratively off course. I’m actually already in bed but it’s cold so I use my laptop to warm me up. It works! So far, I like this comic, and though I know it would be better to wait a year I keep coming back. Love it, and the third panel, holy cow. Beautiful. I keep going back to just look at it and taking in its awesomeness. It’s all getting very dramatic and I love your pacing, I wait all week to see the next page(s). Yeah, I am pretty sure that he is going to be like “NOW THEY TAKE YOU AWAY FROM ME TOO. THEY MUST DIEEEEEEE!” And he’s going to be a miserable bitter old lonely man who destroys everything in the wake of this fight! Steel Magnolia – women can be hard when they need to be. I love how Phe looks in second panel. This argument isn’t about either one of them being right… There’s not really a “right” side here. Each of them wants what they think is best, and has their own set of points on why they think that way. Luca wants justice for the wrongs done to him, and to prevent more wrongs from coming to those around him (or more to himself). In a way, he is vying for protection, although it’s a more offensive protection. Phe wants domestic safety. She doesn’t want to feel like she and her children are being placed in the backseat of Luca’s life for his justice. She doesn’t want him to lose himself to that justice. She also wants to protect something, but her methods are more defensive and non-aggressive. While both sides have their validity, from personal experience, I’m with Phe. Luca is being consumed by his desire for justice, and is totally blind to the pain that it’s causing his wife and daughter (his son doesn’t seem to care so much). When diplomats seek him out, he snaps at them because of his personal biases, and doesn’t bother to even POLITELY decline their requests. This could spark an unneeded war, bringing a lot of death to his country and unhappiness to his people. Phe is trying to AVOID this, and keep her family together. Re: his wife is meddling in his politics. Can’t have your cake and eat it, too! The cake must be ice cream cake. And will melt if not eaten. Therefore, he must eat the ice cream cake of revenge. Whiiiiiiich is choosing Phe, I guess. The Lady and the Tiger – chose one or the other, is it? Well, for the sake of the story, I’m guessing the Tiger. Excited as ever to see where this is all heading. Your art is still wonderful, but this page is a bit static. I suppose that must be hard to get around with scenes like this. I hate to admit that this is one of my favorite type of scenes to write (and read of course). It’s the type of thing that can push a dramatic character like him over the edge. And he won’t realize it until he’s looking into the Abyss. Can Not Wait for the Next Page! Luca is acting as he is because he feels hurt, from the torture. He would interpret Phe’s reaction as a betrayal to him, as if she is ignoring the pain he has suffered and what they took from him. It is likely that he would reject her: viewing her as a traitor, and descend into a paranoid madness. By this, I mean he knows he has enemies, real enemies who hurt him, and they are in another country, but now even his family, his soul mate has betrayed him too, and there is no one left but him. And so in his loneliness he will methodically work to carry out his revenge, which will soon become an insane plot to gather all available power in order to rid the world of his every enemy. In this way he believes that he is rectifying all injustices and restoring perfect order. …To quote an earlier page. …This is what hurting is, Luca. I’ve never really commented before, but this… this page is just, simply, awesome. The way you portray emotion is so prominent… Phe, as said, feels so real. I think I even got a bit teary-eyed. Your characters are so deep and complex. ;-; I seriously don’t have all the right words to describe it. HA! I was just voting for the Meek and the captcha character it gave me was Angora! This page was emotional and powerful. Good job. I love the eyes in that last panel…. Small thing I feel like I should point out in what is otherwise a perfect page: the speech bubble in the first panel on the right has some sort of error going on with it. I wanted to compliment this page… but seeing the obscene stream of brown-nosing indigent comments has kinda put me off. They do that a lot. No point trying to say well what a thousand people have said poorly before me. Still… I am impressed that she is vocalising her concerns in a rational manner. That is… unconventional.